It's a beautiful day in the neighborhood...for a morning workout! I had a client cancel this morning due to sickness, sad times. But happy times were just on the horizon. As I walked out of the gym with a whole hour to myself at 6:15 a.m., I felt the cool air and breeze and realized that I had just been given a gift. It was only 70 degrees at that point and I took full advantage. I drove home, grabbed a sleepy dog and headed to my neighborhood park at a fast paced walk. There I worked all of my major muscle groups PLUS got a good 30 minutes of cardio in. Here's this morning's quick, on the fly, workout. Continue your fast walk, jog or run to the next bench or bleacher set and repeat...and repeat...and repeat until you're out of time. It’s super hot outside right now which makes it the perfect time of year to get in the pool for your workout. Getting into the water is a fantastic way to build muscle and burn calories like crazy. Want to know why? Well, I’ll tell you. It’s good for everyone...young, not-as-young, people with joint issues or arthritis, folks recovering from injury, or others who just want to try something new for a change or as a cross training option. Swimming laps uses all of your major muscle groups including your back, legs, arms, chest and core. In fact, swimming laps for 30 minutes can burn up to 300 calories, is great cardiovascular and strength training work. Have the right equipment. A comfy swimsuit and goggles are all you need to get started. Start slow and build up. Swimming can be very challenging for the newbie, so be patient with yourself. Begin with 5-10 minutes and then work up to 30 minutes. Breathing is important. Of course it is, right?! But finding a breath rhythm during your swimming is the key to building your stamina. Needing something more interactive than swimming laps? Well, look no further than a water aerobics class. Still low impact, these classes can help build muscles and increase your cardiovascular fitness. A typical 50 minute water aerobics class can burn up to 260 calories! Even playing the pool with your kids can be a great workout. Resistance from the water is a great way to ease into strength training. So get in the pool whether playing or lap swimming. Have fun in the water...safely! Summer's are made for BBQs, vacations and pool parties. Make sure that you and your loved ones stay safe around the water by checking out these water safety tips from the Center of Disease Control (CDC). For more information, visit the CDC website. · SUPERVISION. Designate a responsible adult to watch young children while in the bath and all children swimming or playing in or around water. Supervisors of preschool children should provide “touch supervision”, be close enough to reach the child at all times. Adults should not be involved in any other distracting activity (such as reading, playing cards, talking on the phone, or mowing the lawn) while supervising children. · BUDDY SYSTEM. Always swim with a buddy. Select swimming sites that have lifeguards whenever possible. · AVOID ALCOHOL. Avoid drinking alcohol before or during swimming, boating, or water skiing. Do not drink alcohol while supervising children. · LEARN TO SWIM. Formal swimming lessons can protect young children from drowning. . However, constant, careful supervision and barriers such as pool fencing are necessary even when children have completed swimming classes. · LEARN CARDIOPULMONARY RESUSCITATION (CPR). In the time it might take for paramedics to arrive, your CPR skills could make a difference in someone’s life. CPR performed by bystanders has been shown to improve outcomes in drowning victims. · DO NOT USE AIR-FILLED OR FOAM TOYS. Do not use air-filled or foam toys, such as “water wings”, “noodles”, or inner-tubes, in place of life jackets (personal flotation devices). These toys are not designed to keep swimmers safe. Super Tasty, Light Summer Wrap! 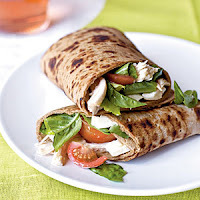 Best thing about this wrap is that it is light, perfect for summer and loaded with good, whole ingredients. I made mine with a light Flat Out wrap (90 calories for the whole big thing!). The entire wrap is only about 300 calories and has a bunch of fiber…12 grams with the light wrap)!!! Check out the super easy, flavorful recipe by clicking here! · Tell the world. This is an important step in the road to NYR victory. Tell your friends, co-workers, family, even the cashier at the grocery store that you are vowing to quit smoking, lose 10 pounds, or get to the gym 4 days a week. When your will wanes, the peer pressure that you’ve created for yourself will help you keep on track. Can enthusiasm make your workout easier? A dear friend frequently sends me e-mails with encouraging words, forwards newsletters that apply directly to my line of work or encourages me to read blogs by motivating writers. 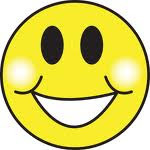 I received such an e-mail this week talking about enthusiasm and its effect on the effort you exert at work and life. This particular article struck me because of the lack of energy I’ve been feeling. My workouts have become arduous and just plain hard. Eating healthy is a top priority but I feel like I have been exerting maximum effort to make the right choices. And my work, which I LOVE, has been sucking the strength right out of me. Perhaps you can relate to some of that. If so, read what Lou Tice, founder of the Pacific Institute, has to say about all that and apply it directly to the areas of your life where you feel drained. “Did you ever notice that the people with the most enthusiasm are also the ones with the most energy? There is a scientific reason for that. Neurologists have proven that when you do something with enthusiasm, it takes approximately one-tenth the effort that it takes to do ordinary things. So people who are enthusiastic about their work don't feel dragged out at the end of a long day. Instead, when they stop working, they are likely to feel exhilarated. So live with enthusiasm and live life with energy! Go into your workouts with the attitude that you ARE doing something good for your body, it's important and you will succeed. Choose the right foods with the attitude of eating for energy and life. And recommit to your healthy lifestyle because you only have one body and it's a priority to take care of it! I just made a new 50 minute playlist for my spin class...check out some of today/yesterday's greatest workouts songs... Have some good one's of your own...comment and share them! Sometimes we eat because we are in a certain mood (think chips and ice cream when you’re feeling down), but did you know that what you put in your mouth can cause good and bad moods too? Choose the following foods for a mood boost. Salmon and Walnuts. These super mood boosting foods are loaded with Omega-3 Fatty Acids which have been all over the news as great for the heart. Not only are they great for your cardiovascular system, they are used to build neurotransmitters like serotonin which can prevent depression. Milk and Poultry. Besides being delicious, milk contains tryptophan which relaxes the body and releases the feel good chemical serotonin. Milk does a mood good! Dark Chocolate. Hurray! It’s true, dark chocolate IS good for you…in small amounts. Nibble on a small square of dark chocolate (no more than 1 oz) for a mood lifting dose of endorphins released by the phenylethylamines in the tasty stuff. Remember, it’s only good in moderation. Foods to avoid if you want to be happy. Sugar and white flour. Although some of us swear by the sugar high we get after a piece of cake or handful of candy coated chocolates, we may often forget about the crash a hour or so afterwards. And comfort food like mac and cheese and pizza always sounds like a great idea when we’re down, but did you know that it can take you even lower? That’s right, refined carbohydrates like sugar and white flour (white bread, pasta, etc) gives us a little energy compared to the crash (sugar low) that will come afterwards. If you’re craving carbs, go for fruit if you’re tasting sweet (or a square of dark chocolate) or a whole wheat pasta dish which will stay with you longer and control your blood sugar instead of spike it. Alcohol: You might get a nice, happy, relaxing buzz upon a drink or two, but alcohol is a depressant and it can impact the quality of your sleep so it’s a double negative whammy on mood. Fast Food: Yes, it’s convenient and it might even be tasty, but it is not good for you or your mood. The ingredients in fast food are very, very refined which means that they are quickly absorbed by the body without any long-term sustenance for the body to use later. The fat content in fast food can also leave you feeling sluggish and can cause a depressed mood…so stay away!